If you’re reading this blog, you probably play an electric guitar or bass and have a general idea of what an instrument pickup is. But if not, here’s a quick review. A pickup is a transducer that captures or senses vibrations from a guitar or bass and then converts that energy to an electrical signal. That signal is passed through an amp and speaker to produce sound. Magnetic pickups are the most common type of pickups used on electric guitars. A coil of wire wound around a magnetic core will generate an electric signal when a string made of magnetic material vibrates in the magnetic field. There are many variations of magnetic pickup design, but all function due to this principle. Magnetic pickups are used on all Ernie Ball Music Man electric guitars and basses. There is a completely different type of pickup, called a piezoelectric pickup, which is pressure sensitive and generates an electric signal using vibrations. Piezo pickups are much more sensitive with a broader dynamic range and output a more acoustic-like sound. Many of our John Petrucci models incorporate piezo pickups to create an extremely unique tone. Electric guitar and bass pickups can be single coil or double coil, often referred to as a humbucker. Single coil pickups are the original and most basic magnetic pickup technology. They produce a bright, clear tone, with lots of room for dynamics. Our Albert Lee signature model is an example of an electric guitar with a classic single coil sound. As music evolved and players explored new and louder sounds, the hum produced by single coils grew more noticeable. The solution? Double coil or humbucker pickups. The addition of a second coil, with opposite magnetic polarity, cancels out the hum which allows for increased output without increased hum. Humbucker pickups typically have warmer sound, as a wider portion of the string is generating the signal. This is referred to as the aperture of the pickup. Our new St. Vincent signature guitar includes 3 mini-humbuckers, which have a narrow aperture for a humbucker, and create a focused, full, and powerful sound. Our electric guitars and basses often take advantage of single and double coil pickup combinations to produce a variety of bright and fat sounds. Ernie Ball Music Man has also developed and patented the Silent Circuit, which reduces hum from single coil pickups without altering the tone. Passive pickups are the original pickup technology and have powered electric guitar and bass sounds for classic recordings from Eric Clapton, Paul McCartney, and more. They are still the most common form of electric guitar or bass pickup, and are largely responsible for the “classic” electric guitar and bass sound heard on so many hit songs. Our new Cutlass and Caprice electric basses utilize this type. Unlike active pickups, passive pickups don’t require a battery or external power source because they don’t have a built-in preamp or tone-shaping features like an EQ. Many players argue that the lack of additional electronic features on passive pickups allows the player to create more nuance. The single biggest disadvantage of a passive pickup is that their sound can be compromised by cables of length or poor quality. Active pickups have a circuit built in which provides a lower impedance output and isolates the coils from the controls. This reduces the adverse effects of cable capacitance, but also eliminates the options of connecting tone controls directly to the pickups, and pickup coils directly to each other. These options allow for creation of many classic sounds that players desire. Active instruments give more control over the tone and signal output thanks to on-board preamps and EQ’s. Using passive pickups and controls combined with active circuits, the player has the best of both worlds. Players can have the sound of passive pickups, higher output, more control over their tone, and no worries about long cables. Here at Ernie Ball Music Man, we use a variety of pickups (as shown by some of the guitars we’ve already mentioned), some of which are built by companies like DiMarzio, and some that are built from scratch in-house. In general, our bass pickups are completely original designs, and our StingRay electric bass pickup is a classic example of Ernie Ball Music Man engineering prowess. Most double-coil pickups are wired in series, but the StingRay’s is wired in parallel, and large magnets give the pickup increased sensitivity, all resulting in its legendary punchy sound. 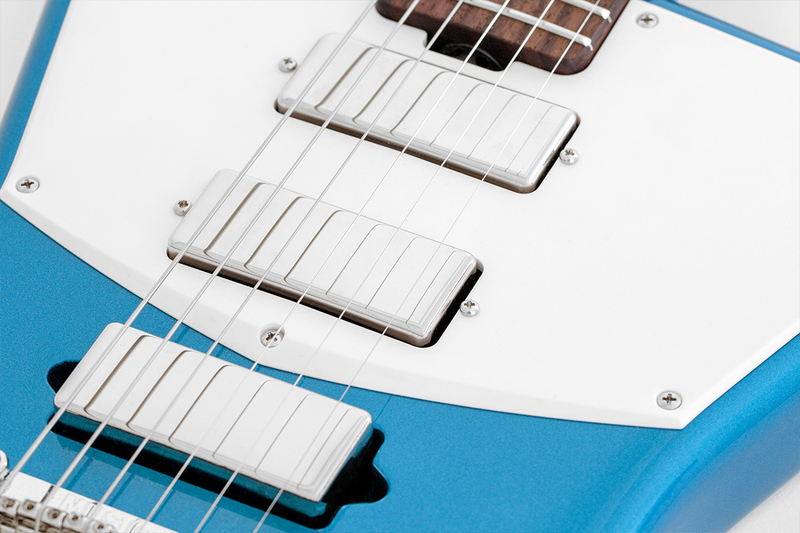 Many of our new electric guitar models, like our Cutlass and StingRay electric guitars, also feature custom-built pickups. For these two guitars, we built custom-pickups that allowed us to tweak and evolve classic guitar tones. Thanks for this. Although I knew most of it it was good to have things summarised in one place. I always use Ernie Ball strings and my favourite is now the Titanium Coated but must have an Ernie Ball guitar before my hands give up on me! As a huge Albert Lee admirer that would be the obvious choice but which pickup combination? Another of my guitar heroes uses an Axis model, Tony Vegas if the UK Eagles tribute band Talon. Tony is more Joe Walsh than Joe! Great products and a great company obviously. These newsletters are really appreciated.